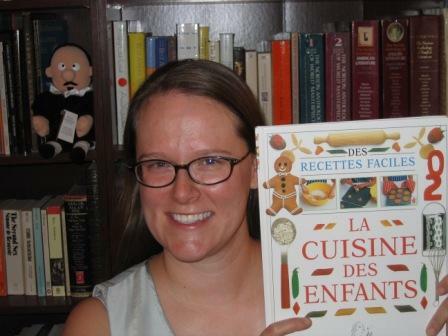 Thank you Kate for asking what we do at home to help our children explore reading and writing in more than one language! I am really enjoying this stage a lot and really enjoy discussing with others what is and is not working for them, so I hope all of you will leave comments on your experiences! The best information I have received for our biliteracy journey (or parenting in general) has been from other parents sharing their tips and us trying those out which make most sense. We never did anything in particular to strongly encourage our kids to read. We have always had tons of books around (presents from friends and family, $1 books from library sales, books we check out from the library, etc.). We don't have much money so we rarely have the "top" books around that everyone is raving about. We never had any of the fancy "teach your kids to read" programs or anything like that. We read to our kids every day (simply because we love it) and let them ask a ton of questions (even if sometimes it takes forever to finish the story and I'm worn out by the end) and we ask them a ton of questions. On a side note: this has also been helping me to keep up with children's German vocabulary! 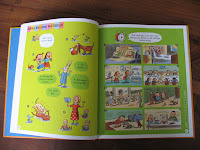 I read to the children from English or German books, my husband usually only reads them German books. If we read an English book, we usually discuss it in German. When they are a little older and I feel that their German is more established, I won't be as hestiant about discussing things in English as well as German. When our oldest was around 16 or 17 months old, my mother purchased him one of those Alphabet Puzzles. I complained to her saying that he was far too young and would only lose all of the pieces (or I'd be picking them up all of the time). However, that puzzle was a hit and my son learned many of the letters of the alphabet. A few months later, my sister-in-law and her friend visited from Germany and brought with them two additional puzzles, this time with the letters of the names of our oldest and his newborn brother. Again, our oldest was completely fascinated with the letters and by the time the summer was over, he knew all of the letters of the alphabet (now in German) by heart and could put all of the puzzles together! I was a little amazed. When we went to California for my grandmother's funeral (after a battle with Esophageal cancer), our oldest would call out the names of letters everywhere he saw them. It was truly fascinating to me. It is important to note that our son was first introduced to the letters in English (with my mother) and then further learning was done in German (our German family and ourselves). Looking back at it, there didn't seem to be much confusion at the time. He simply chose the name for the letter that came first to his mind and that seemed to satisfy him. We didn't pressure him either way and I believe it all just seemed like a game to our son. He would get wide-eyed reactions and praises from adults either way. Some people would correct him if he said the German "Ah" for the letter "A" but since he was so young, I don't think anyone really cared either way. Plus, until we could talk with him about the differences between English and German, it felt a little useless to be correcting him. We also didn't have any knowledge about not introducing the name of the letter rather than the sound of the letter. I recall a conversation with a German family member who said that this is what they are doing in school now and that we should not be teaching our son the names of the letters! I worried a bit and my husband and I even had a bit of a discussion about it. Luckily my husband is very level-headed and said, "Let's not worry about it either way. He is having fun and is learning something. He is only a year old, for goodness sakes!" And he was so correct. We just let things go and in the end it has been fine. Besides, every few years there seems to appear a new and better way to teach children how to read. New books are purchased, parents are informed of the new method and that is that. Personally I don't think there is anything wrong with this (other than the horrible waste of natural resources on getting rid of the old books and printing out millions of new books) but I know that there are many ways to approach learning so I try to just use what I have at my disposal. Later when our oldest learned to write, he would ask us how to spell something and we'd say something like, "Bee, Eee, Eee" for the word "bee" and he'd ask, "Which Eeee? The one with the three lines or the one with the dot?" Basically he was asking, is it the English "E" letter or the German "I" letter. The same with the letter "A" in English and "E" in German, both with similar names. He'd say, "The one like this?" and he'd draw an "A" in the air, "Or the one with the three lines?" This way of distinguishing between letters was his idea and it has worked wonderfully. His brother, who can also write now, is doing the same in terms of distinguishing between letters that sound the same. One could argue that they could know which letter we are providing based on the language of our conversation at the moment. But it just isn't that simple. Since we are often mixing the languages of the words being spelled and the language of the letters to spell the words, it can get a little confusing, so it is easier for my kids to just ask me which I mean. 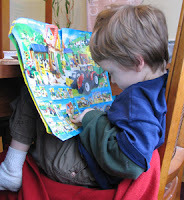 Learning his letters early did not mean that our oldest learned to read any earlier. This is what I find so interesting. Just because a child seems to show accelerated ability in one area doesn't necessarily mean that he will just move right onto the next step without missing a beat. All we can do is introduce and see where our children are at and if they are interested and ready. The concept of reading words would take a few more years to "kick in" for our oldest. Again, we never pushed him. We would point to the words as we read them and if this annoyed him, we would stop. Then a few days later we'd try again. We'd pull out a learning to read book (in Germany there are many that have pictures instead of words which the kids can call out - this helps them get a sense of words as meanings on the page and that they follow a certain sequence) and if it was too cumbersome or if the kids just wanted to space out and listen, then we'd just read the words out. Being that I am not a native speaker, we'd have a great time together trying to figure out what the picture was exactly and then looking it up at the back of the book. Mama: "Ohhhh, it isn't a cabbage, it is a lettuce!" The kids: "No way, let's look at the picture again. A lettuce?" Mama: "Yea, look here. It could be an Iceburg lettuce, right? The kind that is in a ball shape. Rather than a Romaine lettuce which has the longer, darker leaves, right?" Kids: "Oh right, Iceburg lettuce, of course. Ok, that makes sense." The kids aren't really reading but they are having a tremendously fun time and I hope they also learn that if you don't have the answer, that is ok. Look it up in the back and talk about it. What fun! 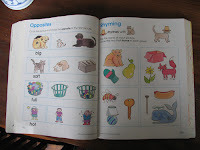 Last year (when our oldest was 4) we purchased a few "learning to read" books based on the phonic method (words that have the same sounds) since he expressed an interest to learn to read. Because I can't make a purchase without first checking out everything I can get my hands on (which includes reading a million reviews and analyzing my children's individual educational needs from many different angles), I spent quite a few days looking into everything I could find. In the end, I pretty much just purchased what seemed to fit my son's interests best and which seemed the most logical learning-to-read approach to me: the "Now I'm Reading" series. I purchased a Pre-Reading book for our younger son and a Level 1 book for my oldest. The pictures are really fun and the stories start with a short sentence and then build upon that based on the specific "sound" that the story is focused on. Each time the child can read the story himself, then he can place an "incentive sticker" on the main page until the 4 stickers are used up. 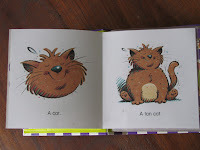 Our oldest seemed very interested in the books when we first got home after purchasing them but after the first page of the first book, he resisted and refused to take any interest in the books other than just looking at the pictures and asking what this or the other word was. So, we let him just look through them and then put them on the shelf, pointed out to him where the books were located and left it at that. It wasn't until we got back from Germany many months later that he pulled the books down from the shelf and said, "Ok, I'd like to learn to read now." And that was that. He worked through each and every one of the books in a matter of a few weeks. Since then we have checked our more phonics books from the library and he has read through each of them (with our help at first). In addition to the phonics, there are the "sight words" that he learns along the way (for example, the word "the") which he doesn't try to sound out, he just knows now. A large part of the process is also memorizing the books by heart, which is why we make sure to introduce new books on a regular basis but still continue with the "easy" ones that he has been able to learn. This way he is encouraged by what he can do easily and is more willing to try a new one. Once our oldest showed such an interest in learning to read, we collected what we had for learning to read in German. 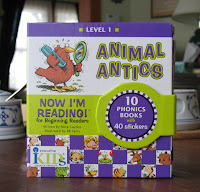 Unfortunately, there is a very small selection of books that really work at our son's age since the assumption is that children are much older when they learn to read and the concepts and texts are aimed at children who are a little older. 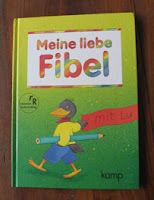 However, we purchased a fabulous book from Alphabet Garten, "Meine liebe Fibel" which does a great job of introducing the letters and providing fun activities. We are doing pretty much the same things in German as we have been doing in English, guided, of course, by the letters provided in the Fibel book. We also brought a bunch (over 300 lbs) of books back from Germany so that we can switch between different books and activities to keep things interesting. One day while we were in Toys R Us purchasing a birthday gift, we came across the "School Zone" books which are packed with workbook activities that my kids LOVE! When people ask why my kids beg to "do homeschooling" it is because of books like these. 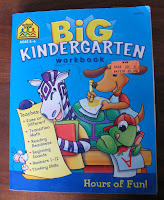 We purchased the Preschool and Kindergarten books for the boys and took them with us when we went to Germany. The boys were simply ecstatic about them and the whole family got involved in helping them with their homeschooling (even though the text is in English). The books cover all kinds of skills that children are supposed to be learning in school: opposites, comparisons, writing, first letters, and much, much more. I'm just sad that our kids got through the books so quickly since it is hard to fine more that are so much fun and such a good price ($10) for so many pages (over 300)! 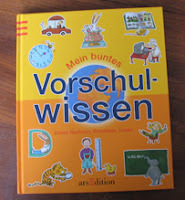 For a great general book in German, we have been enjoying the "Mein buntes Vorschulwissen" book. It has a long list of skills which are covered in a fun, colorful way. 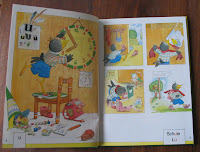 The pictures are great fun and we have fun just going through the book until the kids get tired out. The best thing about the book is that is has ready-made open-ended questions to keep the discussion going. There are some right and wrong answers to things but there is always room to discuss why, which, as far as I'm concerned, is the most important part of learning - the contemplating of ideas and reasoning things out. The desperation of our students to just "get the right answer" above all else is so depressing to me. The very first photo is of the kids "doing homeschooling" but as my son pointed out today, "Mama, right now we aren't doing homeschooling. We are just coloring." Little does he know that he is learning A LOT about numbers and math as he does his color-by-number books that I got from the clearance section from "Half Price Books" a few weeks ago! These are the little treats that make it all so much fun! What about our second and third children? What is the status on their learning to read progress? Well, our middle child (3 years old) totally follows in his brother's footsteps and has been writing up a storm. He doesn't write all of the letters correctly but he is loving his new-found ability. He hasn't shown much interest in reading but has been doing some neat pre-reading things like "reading" books to his older brother and younger sister with his own retelling of it. He sits in the middle with his siblings on either side and, in a very mature voice, "reads" them each page at a time and discusses with them what they see on the pages. Instilling a love of reading is paramount, regardless of the language(s) involved! I'm going to post a link to this page on my blog, if you don't mind--I think people will find it fascinating! Alice: Thanks! It is a very interesting process, far more exciting than I thought it would. I'm really enjoying it. Sarah: I'm flattered that you would like to post a link to this entry. It ended up longer than I had intended but I just kept thinking of things. Yes, it is amazing how much a love of reading can bring to children (and later adults)! 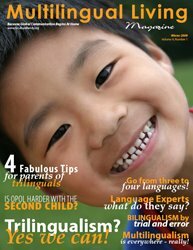 Hi there, I'm here via 'Bringing Up Baby Bilingual' and I love to see that this is actually working in your family! My daughter is still in the early stages of picking up language(s), but I can't wait until she starts speaking in complete sentences! We've recently lucked out and found a bilingual English-German home daycare for Sophie, and we're hoping this will help her to actually speak German. So far, she understands both equally, but has many more English than German words. Thank you for sharng your methods and experiences. I guess that our way of doing things is a bit different, simply because we are dealing with two entirely different ways of writing two entirely different languages. But I just try and make them both as natural a part of things as possible. I so tend to use flashcards more with the Chinese, though. Hey Corey - BTW, I'd love to share anything with you for the journal but I have no idea what! anyway, very interesting all of this - I can't believe you're homeschooling in both - that's just amazing! smashedpea: Thank you for stopping by! Another bilingual family, yippee! Yes, I can imagine it is tough when you are the only speaker of the language. Does your husband know enough German to follow most of the conversation? Part of the reason we decided for ml@home was because we felt it would provide more language exposure but I'm not sure how long I can sustain it unless I work on my German more. I feel like I am losing a little all of the time. Juliet: Oh right, you have two scripts to deal with! Yes, I totally agree that is the way to go: keeping it as normal as possible and lots of fun. Wow, that is just fabulous for your kids! Nicole: Hello! I keep meaning to stop by and say hi. No worries about not having anything to write for MLM, I'm sure something will come to you and then we'll be here. 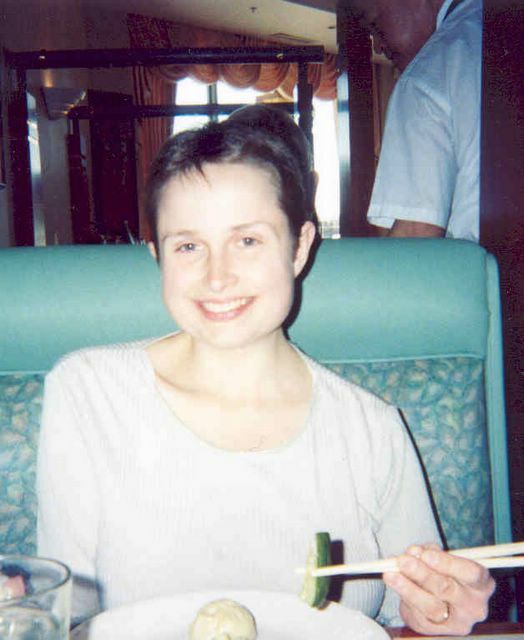 :-) I love the entry in your blog about nursing and teeth. Hee hee.